Another Saturday, another 3am gathering of mad buggers at the BP garage next to The Lord Charles hotel. 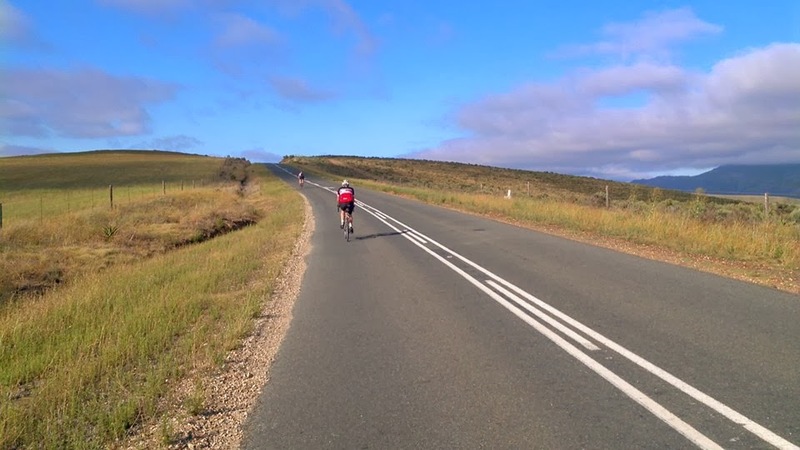 This time the we were three – joining Henri and I was Grant Cox, fellow randonneur and LEL rider. No need for gilets today, even at this early hour the day was already warm – with a promise of hotter and windier conditions for later in the day. Introductions and formalities aside, we headed out. 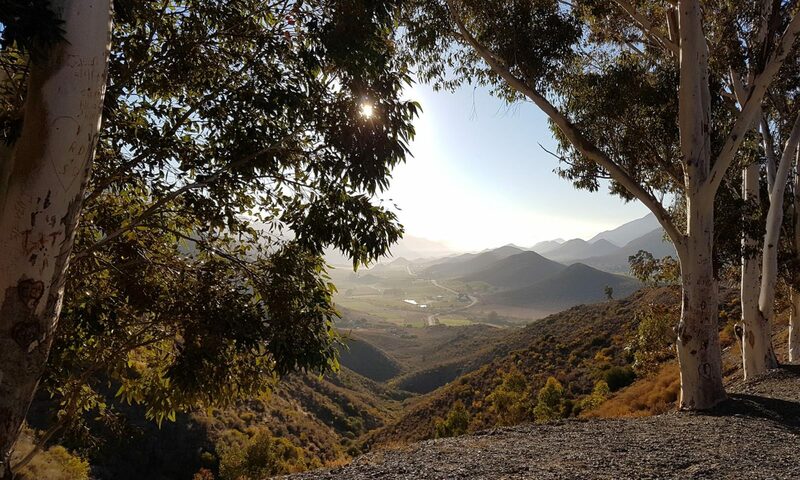 Our route may be starting out along familiar roads, but Henri had devised an exciting and inspiring variation beyond the 80km water stop in Villiersdorp. 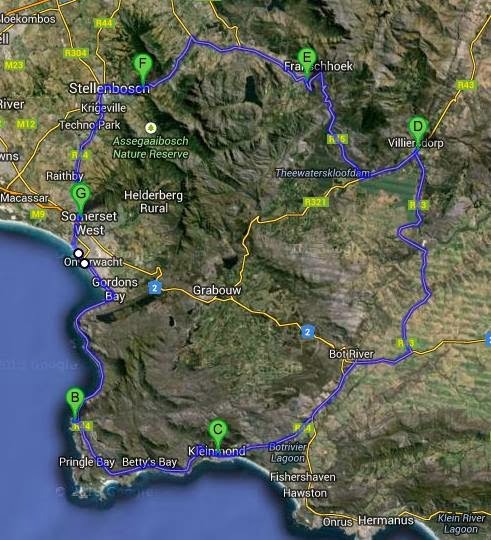 Instead of heading out towards Worcester, we would be doubling back to the start of town, swinging left along Theewaterskloof Dam, and after crossing the dam wall we would be climbing up and out of the bowl of mountains and into the golden rolling pastures of the Overberg. We had to get there first, and as we left Franschhoek behind and started the long haul up the pass, I wasn’t feeling all that sure I would. Labouring up the climb, I was even contemplating bail out options – wouldn’t it be better to turn back at the top? It would be much quicker for Yoli to come pick me up, and I was sure somewhere would be open for coffee whilst I waited until a slightly more civilized hour to call her for help. I shook my head and focused on the road ahead, with barely a quarter of our distance covered it was going to be a very long day if I started dwelling on thoughts of defeat. The road was steep, and yet again I’d left my crawler cassette at home. The wind was strong too, and getting stronger as we rose up the mountain. Fortunately, once we rounded the first dogleg beyond La Petit Ferme, aside from the occasional buffeting from the side, it was mostly at our back, giving a gentle and welcome push up the climb. The moon shone high and bright to the left, so much so once again we could switch off headlights and enjoy the tranquility of the morning. Doubting myself here would serve no purpose, so alternating standing and sitting, I ground on up. Somewhere close to the top it occurred to me that maybe I was low on fuel. The Muesli jar was almost empty and perhaps the Squirrel Pillows (or whatever Ben’s breakfast cereal was called) which I’d topped up my bowl with didn’t quite have the same energy value. Rounding the final dogleg was a battle, the wind was blasting straight down the last stretch of road to the top, and trying to turn into it like wrestling an angry gorilla. I slogged onward up into a blanket of fog that was scudding across the neck of the pass. To the right I could just make out the normal viewpoint stop through the gloom – it was empty. The guys must have decided to stop over the top – a good call giving the damp and cooler air. Easy to get a chill after working up a healthy sweat. And sure enough, red blinking lights appeared as the crest of the hill fell away ahead. “Mother F…er” I exclaimed, too tired to bother finding less profane language to describe how I was feeling. Grant echoed my feelings – Henri smiled in amusement, way too fresh and cheery. At least the two significant climbs of the day were behind us, and ahead lay a long blast down to that water stop, and a new and unexplored stretch of road. We charged down the pass towards the dam, the first grey light of the dawn gradually rising up to meet us as we sped down. I wobbled into the first corner, half an uneaten energy bar wedged in my left hand. Probably not the smartest move when wrestling a strong wind, tight corners, and rapidly increasing speed. I jammed it in my mouth, planted both hands firmly on the bars and leaned left through the bend. Ahead I could see Grant’s tail light just about to negotiate the next turn, and Henri’s front light already exiting the loop of road. As we raced down, I’d see them again and again, but the lights became less obvious as the light started to pick out the shapes of them on their machines. The descent freshened my legs, the food was beginning to have an effect, and a stop for Grant to fix a puncture was the final part of the lift I needed to my spirits – a brief pause to admire the stunning fynbos clad mountains all around us. Somewhere shortly after we got underway again I took a turn on the front, nothing like putting some work in to banish negative thoughts. It felt great, and I was happy to tow the remaining 10km or so into Villiersdorp. We maintained a decent pace and the town was soon coming into view, ringed with towering cloud topped mountains silhouetted against a deep blue sky . It was going to be a stunning day. On the outskirts of town a small boy started to run alongside us on the far side of the ride – as we picked up pace so did he, racing us to the junction we would come back to after our stop. He stuck with us, not falling back at all. It would have been impressive for anyone, but this kid was sprinting barefoot on loose gravel, and he was smiling and waving the whole way too. The Shell garage was open, at least, but it’s provisions were somewhat on the meager side. They had the essentials though – coke and water in my case. The coke serving a dual purpose of caffeine replacement for my usual morning coffee, and energy supplement for the rear water bottle. I’d managed to stick to plan and drain both bottles by the time we stopped – an attempt at staving off my usual hydration issues on what was forecast to be a fiercely hot day. I also forced some food down too – I wasn’t hungry, and it was a struggle to eat, but I had to try and avert my other failing of not eating enough and running out of gas. We didn’t linger – more than half the ride lay ahead still, and adventure lay ahead. My concerns about the road were soon alleviated. The surface was good, and it was reasonably wide. Traffic was picking up, but most of it gave us plenty of room as it passed by. The road rose and fell as it meandered along the eastern side of the dam. I heard a curse from Henri, he was stopping and dismounting behind me. “Mechanical!” I called ahead to Grant. “Sorry for an unscheduled stop so soon” Henri apologized as he quickly located and removed the wire that had pierced his tube. “Just luck I think” was the best I could come up with. question was soon being answered as the road swung left across it. Leaving the large expanse of water behind, we began what I assumed was the climb up and through the mountains. Henri’s promise of not being as long or steep as Helshoogte proved spot on. What he hadn’t mentioned was how darned pretty it was – perhaps not wanting to spoil the surprise. Farmland pastures gave way to pine woodlands and finally fynbos at the summit. Beyond lay a treat: the Overberg. Having enjoyed this scenic delight on many road trips up the east coast I was thoroughly looking forward to seeing it at cycling speed. As it happened, cycling speed was not much less the driving speed for the first couple of kilometers. My Garmin was reading around 65km/h on the long descent from the top of the pass. The change in scenery was dramatic – the green and rocky slopes giving way to the brown and gold of rolling farmland. That was another accurate prediction from Henri – the last of the significant hills may be out of the way, but ahead was a steady sequence of rollers, each of them tall enough to test the legs and see granny rings brought into use. The sagging spirits from before daybreak were gone though – and even a slight tightening of my outer thigh was not enough to diminish the smile. I mentioned it to Henri and asked him to check my leg extension – I’d had a niggle that maybe my cramps were due to over extending my legs and had lowered my saddle a shade before Wednesday’s club ride. Perhaps I’d gone too far though? He put my concerns at rest though – no indication of being either bunched up or of over extending my legs. There was a long descent over the top, but it wasn’t quite the last, there was one small final rise to negotiate before we could relax. Henri point out a pair of kites high across the field to our right. And as if to acknowledge our interested, one of them proceeded to drop down and fly beside him for quite some distance. Riding just a few meters back, I could see the bird clearly looking down at him as it glided along. It was clearly curious, or perhaps it had learned that humans often jettison edible morsels – kite’s are scavengers after all. Too soon our Overberg Scenic Tour came to an end as we swung right and joined the busy traffic of the N2. A smartly dressed couple were waiting for a taxi beside the road. “Sorry, we’ve got no room left on here” Henri and I commented simultaneously by way of greeting as we passed. They both smiled and laughed as we whizzed by. 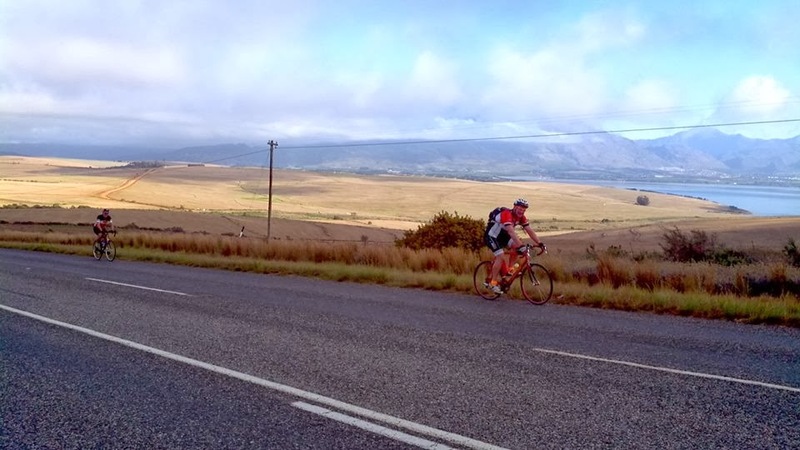 The run down to the Botrivier turn was fast, which was a relief. Even with a wide yellow lane, the traffic was heavy. Riding along a major highway amongst trucks and speeding cars is never much fun, but at least this was brief. We were soon turning left towards Hermanus and our next stop of the day. A padstaal at the Shell garage a couple of kilometers after the turn. I guess today’s filling station of choice would be Shell – no one could claim us of being inconsistent on our fuel stops. One of many ornamental features on their stoep was a rusting bicycle with no tyres.There was an obvious comment to be made about being glad that wasn’t our ride for the day – but being obvious didn’t stop us all remarking on it any way. Inside was something far more important – hot chicken pies. Hot as in just baked too, not hot as in warmed in a micro-wave but with soggy pastry. They were delicious, and quickly devoured, along with a chocolate milk and a further top up of coke in my rear bottle. The pies had been lovely and salty – so I left out the electrolyte tablet this time, and went plain water for the other bottle. “Flat and fast from here now eh Henri?” I queried as we rolled out refreshed. I forget his exact reply, but it definitely contained an added tip that it might be worth learning to love the heat as well. He wasn’t wrong, the day was starting to warm up properly. Less than a kilometer down the main road and we met up with our right turn onto the coast road towards Kleinmond and home. Familiar routes, and a definite sense that the horses were beginning to smell the stable, it was a good feeling. Even better was the slight breeze we ran into too – just enough to brush away the worst of the heat without being strong enough to affect our speed. Rather less pleasant was the roadworks which started at the junction – loose, sticky, tar covered gravel strewn over a long Stop-Go section. All of us commented on the trashing this would be giving our tyres, it was hard to keep them clean even with regular hand and foot wiping and alternating sides of the one-way lanes as traffic allowed. Somehow none of us punctured, and the roadworks came to an end before we rode through Kleinmond high street. A beautiful day and a lovely little coastal town – it felt great to be out riding. Exiting the down and swinging down and through the loop past Kogelberg Nature Reserve we really started to motor. Our pace picked up considerably and we fairly charged through Betty’s Bay, through yet a further stretch of roadworks, out of town and up the short incline to Pringle Bay. It was a struggle to remember a club 100 where we’d taken that stretch of road faster, and we weren’t slowing down either. 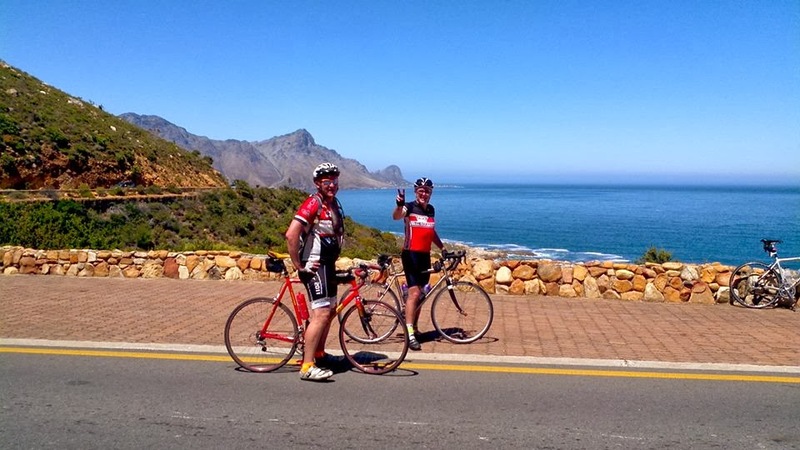 The final rise up and over to Rooi Els was a blast – something got into my pedalling around a third of the way up, my cadence picked up effortlessly, and I found myself shifting up repeatedly. It was one of my least favourite uphill stretches and I was simply flying – the last time I;d looked down my Garmin was reading 30km+ and I’d sped up since then. Before long I passed both Henri and Grant, knowing they’d give me some stick for suddenly surging ahead. In that moment it didn’t matter, the crest was in sight and I was experiencing first hand what I’ve seen referred to as No Chain – pedaling so effortless that it’s as if the bike had no chain attached. On any ride it would have been a joy, with 170km already on the clock it was an unexpected delight. Henri got his own back on the descent to our final water stop, whizzing past me with a whopping 72km/h showing on his bike computer. No surprise that spirits were high as we pulled into Rooi Els and made for the local shop to top up supplies. More water for me, and another Coke – on any normal day that would be a sugar overload, but today it was keeping the engine purring along. No signs of distress from the legs either. “How far home from here?” Grant queried as we rolled out again. glorious day. A couple of times along that last stretch we chatted about a possible coffee stop at the end, but as we left Strand behind us and made for home a better idea lept into my head. “There’s nothing to say this has to be a circular route now we’ve done our full 200” I called across to the guys. “I like your thinking“, Grant needed no further hint, catching my meaning instantly. So as we came up to the robot we swung left into Paardevlei and made for Trigger Fish brewery. Some ice cold locally brewed beers would make a far more fitting end to a perfect ride.